Among the plants sacred and closely allied to the mystic life of a portion of the human race there is none more interesting and rich in legend than the mistletoe. This was associated with religious observances before the time of Christ, and is mentioned by our earliest historians. There are over seventy species of this peculiar plant. Both the American variety (Phoradendron flavescens) and the European, or true mistletoe (Viscum album), belong to a family of parasites, so called because they derive their nourishment entirely or in part from some other plant, instead of taking it directly from the soil. Owing to the presence of the green coloring matter (Chlorophyll) in the stems and leaves, the mistletoe is not entirely parasitic, but is to a certain extent self-supporting, drawing but a portion of its nourishment from the tree on which it grows. It is found both on deciduous and on evergreen trees. In some locations in Europe it is especially abundant on the apple tree, and, if in the right climate, there are few tree species which are exempt from serving as its host. 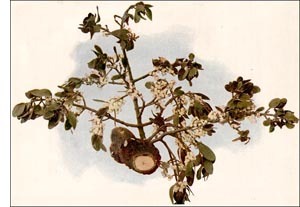 The mistletoe is an evergreen, shrubby plant of slow growth, attaining a length of about four feet, and its duratin of life is practically that of the tree on which it grows. The leathery leaves and rugged stems are yellowish-green in color, and, in the axils of the leaves, are the small and insignificant flowers, which ripen about Christmas-tide into pearly white translucent berries. At Christmas-tide the mistletoe is largely used for decorative purposes, especially in England, where the custom is ancient, and also in our own land, where each holiday season finds more and more of this unique plant gracing chandelier and window, until we, too, may some day find our maids all kissed-"Under the mistletoe bough."